When’s your bougainvillea moment going to be? In reality, Life is pretty simple. And there’s beauty in its every moment. However we make it complex by worrying, fearing, grieving and rushing through it __ so we miss the magic in each moment! Pause. Close your eyes. And feel your breathing. Feel your heart beat. Hear the clock tick. Get up, walk over to your balcony and look out on to the street. Wait for a while and identify the most beautiful thing you see. I just did that. 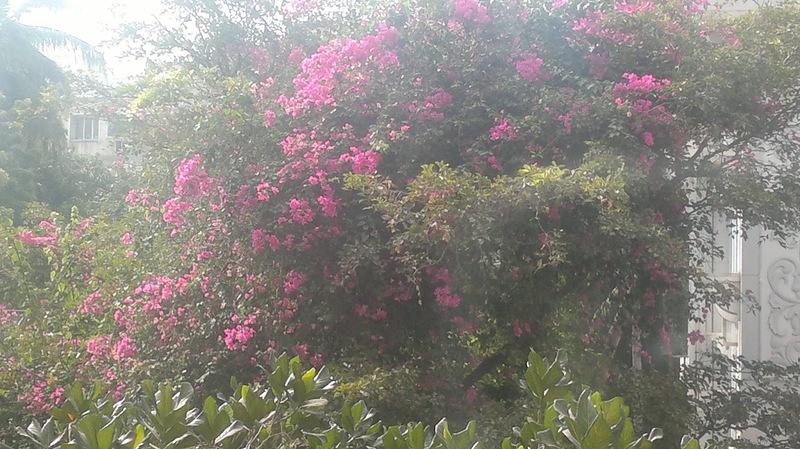 And I saw a burst of bougainvillea blushing at me from across the street. It’s a huge affair. But I had never noticed it until this morning. I am grateful I did. Because it made me come alive. We often take many things for granted. Yesterday, my daughter suffered a ligament tear in her left foot, landing badly after attempting a mid-air split during her dance rehearsals. She’s out of action for at least a week and off dancing, which is her Life, for over four weeks. As she limped around, writhing in pain, I realized how ungrateful we are to our feet. Our cars receive more attention than our feet who have been with us longer and continue to serve us without protest, carrying our entire weight! The way we behave, and the way we distribute our attention, is so unfair. For every problem we face, we have perhaps a 100 other reasons to celebrate. But our problems receive our biggest attention. Somehow, the fickle human mind loves misery. So, we celebrate our sorrows. Always thinking about what isn’t and feeling woeful about Life. Lamenting is convenient. It requires no effort. The mind can and will go on and on and on telling you that you don’t have this or that. Grief, to us, comes naturally! Indeed. We are paralyzed by our insecurities, desires and anxieties. As American author Cynthia Ozick says, “We often take for granted the very things that most deserve our gratitude.” If only we spent a little time each day, to connect with Life, like my bougainvillea moment of this morning, we will see how simple, and how beautiful, Life really is. So, when’s your bougainvillea moment going to be? Author AVIS ViswanathanPosted on January 27, 2013 March 14, 2016 Categories Anxiety, Art of Living, Beauty, Bougainvillea, Christopher Reeve, Cynthia Ozick, Fears, Gratitude, http://schemas.google.com/blogger/2008/kind#post, Intelligent Living, Magic, Miserable, Misery, Sorrow, SupermanLeave a comment on When’s your bougainvillea moment going to be?